This package contains five articles, all providing tremendous color to the events leading up to the first Indianapolis 500. One article describes preparations for time trials, another provides a frist hand account of Bob Burman's world land speed record run where he claimed attaining speeds of 155 mph in the Blitzen Benz. Another article is in poetic style, comparing the Indianapolis 500 to the chariot races of Ben Hur. 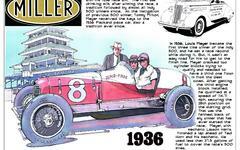 Best of all, though, is Barney Oldfield's predictions of best bets to win the first Indianapolis 500. Oldfield proclaimed that the would boil down to "five out of 46 drivers." About eventual winner Ray Harroun, Oldfield said, "Harroun seems to have lost his enthusiasm in the racing game and announces that the big race will be his last. I am afraid he has his mind too much on his aeroplanes to out-guess the forty-five other drivers." So much for Barney's prognostications. These articles were published May 21, 1911.